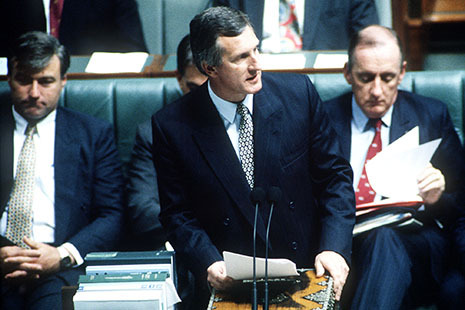 John Hewson as leader of the opposition. THE conventional wisdom in politics – if that is not a kind of oxymoron – holds that oppositions don’t win elections so much as governments lose them. But just over twenty years ago a bright newcomer to political leadership valiantly tried to turn this maxim on its head – and failed. Never before had a political party produced such a detailed and comprehensive election manifesto as John Hewson’s Fightback! program for the Liberal Party – a thumping 650 pages of economic policy, densely argued and statistically detailed. Its basic thrust was a radical remodelling of the economy in general and the taxation regime in particular; at its heart was a shift away from direct to indirect taxation aimed at easing burdens on business and creating, Hewson claimed, some two million jobs. 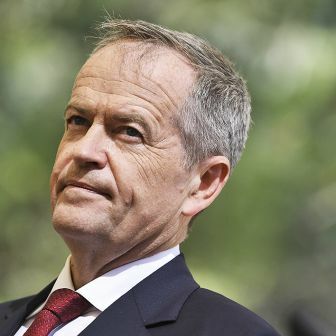 Unprecedented in both policy and electoral terms, it took Australia – the Labor government, commentators and the public – by storm. While very few people understood its detail and complexity, its sheer scale was apparent to all. The Age, for example, commented that the plan was “a grand design of vision, faith and courage” and remarked on Hewson’s “magnificent obsession to reshape the nation’s economy and social ethos…” But while it seemed to come out of the blue, Fightback! was in fact the culmination of a train of thought that Hewson, an economics professor at thirty-one, had been pursuing for almost two decades, drawing on a period with the International Monetary Fund that afforded him a global perspective on economic policy and a detailed understanding of what had worked and what had not. The policy itself was kept under tight wraps in its development stages, and its launch was accompanied by considerable fanfare (even if a copy had been leaked the night before). Its most prominent feature was a goods and services tax set at 15 per cent. Hewson had commissioned calculations at 10 per cent, 12.5 per cent and 15 per cent and assessed their likely impact. The attraction of 10 per cent (the level adopted by the Howard government when the GST was eventually introduced) was that it was both low and easy to calculate; in terms of the revenue raised, though, it would have allowed the abolition only of wholesale sales tax. At 12.5 per cent, the fuel excise could be abolished; at 15 per cent the states could be compensated for the abolition of payroll tax, essentially a disincentive on employment growth. In its final form, Hewson’s GST was proposed not so much as an additional tax but as a replacement for seven separate taxes and duties – wholesale sales tax, payroll tax, fuel excise, superannuation lump sum tax, customs duties (to be phased out by 2000), the training guarantee levy and coal export duty. 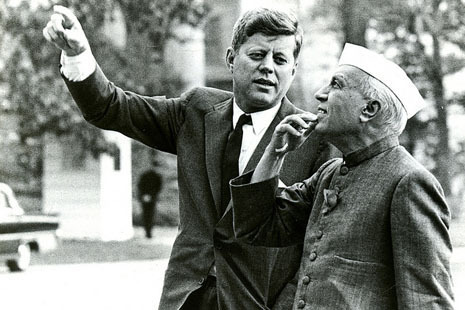 While much of the focus was on tax, the document proposed a range of other radical reforms, many of which had the potential to stir strong opposition. 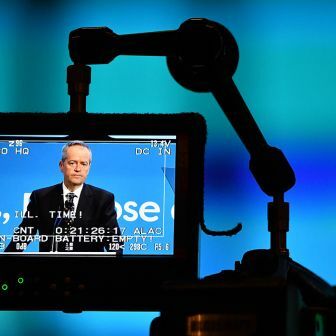 It advocated changes to industrial relations, including the abolition of awards and the elimination of automatic entitlements to unemployment benefits after nine months on the dole; far-reaching changes to Medicare, including the “abolition of bulk-billing except for veterans, war widows, pensioners, health card holders and the disabled” and the “provision of gap insurance for medical bills”; a $10 billion cut in government expenditure partially offset by increases in other outlays, including $3.6 billion in selected government programs on social welfare; and the sale of a number of government-owned businesses. The Labor government, in office since 1983, had boasted that it would shoot holes in Fightback! from day one. 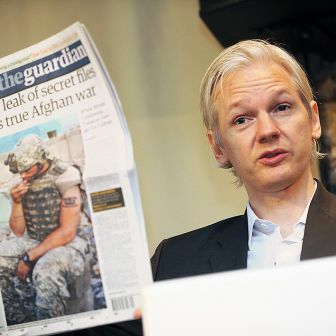 But when it finally had the document in its hands the response was a stunned and eerie silence. The one man who might have led an attack, former treasurer Paul Keating, was by then cooling his heels on the backbench after unsuccessfully challenging Bob Hawke for the leadership. The launch of the policy had the effect of a stone being cast into a quiet pond: the ripples began to radiate. 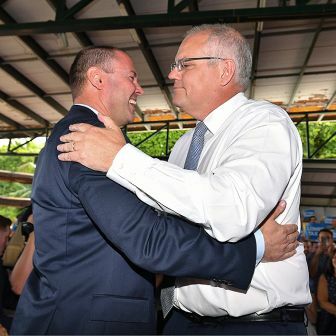 The initial response was left to Hawke’s treasurer, John Kerin, whom Hawke had chosen to replace Keating, but the affable Kerin was found sadly wanting. The government’s ability to counter Hewson was called into question and Hawke’s prime ministership, already weakened by Keating’s challenge, was judged to be losing ground. Kerin was the first to go, with Hawke replacing him with finance minister Ralph Willis. But within weeks Fightback! claimed its second victim – Hawke. The Labor caucus acknowledged a week before Christmas 1991 that only Keating had what it took to head off the challenge. From that moment, the whole tenor of the battle changed. Whereas the government under Hawke had sought to disentangle the economics and attack elements on a piecemeal basis, Keating saw the issue purely and simply as a political fight. He mocked Hewson’s economic expertise, calling him the “feral abacus,” and in one memorable barrage delivered a killer of a line: “If you don’t understand it, don’t vote for it; if you do understand it, you’d never vote for it.” In a sense, it was that repeated message which turned the tide: Hewson hammered away at policy, Keating at politics, and politics triumphed in Keating’s ultimate victory at the “unwinnable” election in 1993. The defeat effectively ended Hewson’s brief political career. There was always an element of calculated risk in going public with such fine detail, and Hewson’s refreshing boldness was hailed at the time. Political commentator and former Labor adviser, Richard Farmer, wrote that Fightback! represented “the most honest and thorough-going attempt to identify [key] problems and to call for the policy change that’s necessary to deal with those problems, of any document that’s ever been produced in this country…” Farmer praised Hewson for putting aside short-term political consequences and calling important issues on their merits. Norman Abjorensen is a Visiting Fellow at the Crawford School of Public Policy at the Australian National University’s College of Asia and the Pacific, and the author of a biography of John Hewson.